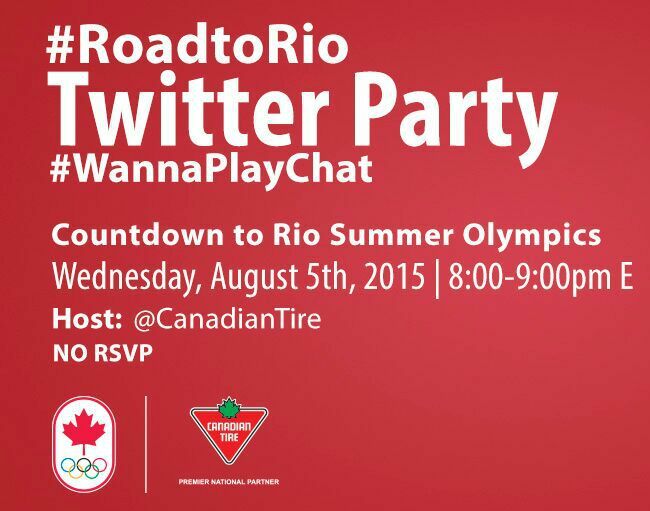 Canada's Olympic Team Prepares For Rio 2016 and A Twitter Party! Our family doesn't play in any organized sports teams but you can't say that there isn't a love of game in our household just the same. Our kids are always wanting to get out and be active on nice days which makes us parents get out and be active. A great way to get some exercise and spend some time with the family. Our daughter has always been a fan of jumping on the trampoline, trying out new flips and her brother likes playing a variety of sports like driveway hockey or just tossing a baseball in the yard with his dad. It all starts young they say. Did you know the Rio 2016 games are just over a year away? Canada's Olympic team is preparing for next year's games in Rio, and are setting their goals on how they want to train on the #RoadtoRio. How will you and your family get ready for the 2016 Olympics? Here are some great ideas to get you started and get your family ready for the Rio 2016 Olympics and the #RoadtoRio! - Pick one summer Olympic sport you've never tried before and play with your kids! Here is a link to summer Olympic sports to give you an idea! - Pick a goal to track *example: how many free shots can you take in basketball, what is your best trampoline move or how fast can you run in 50 meters etc. - Work on your specific skill and see how with practice you can improve throughout the year. Right before next years Olympics, have your family try again and see if they can beat their personal best! - Take pictures and keep score. Right before Team Canada heads to the Summer Olympics next year, compare your families previous personal best! - Pick one sport from your mini Olympics and see what other Canadians have excelled at that sport! To celebrate the beginning of the countdown to next years Rio 2016 Summer Olympics, proud Olympic sponsor Canadian Tire wants you to join in the fun with a Twitter Party! 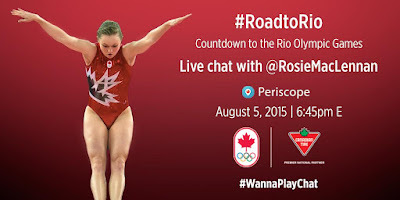 To kick things off, on Wednesday, August 5th log into Periscope at 6:45pm (EDT) and join @RosieMacLennan for a live pre-party #RoadtoRio #WannaPlayChat! 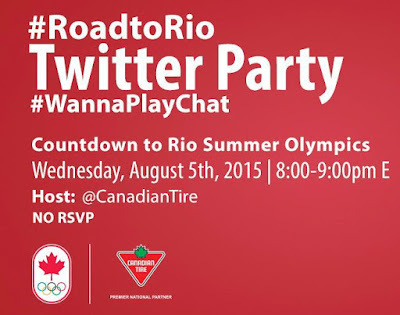 At 8pm to 9pm (EDT) join host @CanadianTire with special guests @btheiseneato & @markadejong for the countdown to the Rio Summer Olympics #RoadtoRio #WannaPlayChat! NO RSVP required! $1000 in prizes! It's sure to be one awesome evening! See you at the Twitter party as we celebrate the #RoadtoRio 2016 Summer Olympics! Sponsored post on behalf of Canadian Tire. Opinions and comments on this blog are my own. Walmart Celebrates The Beauty of Back-to-School! Potty Training With @Pampers Easy Ups!